In praise of Mr. Selleck. My wife and I like to spend some of these cold Wisconsin winter nights–well, as it turns out, many of them–snuggled on the couch, our Yorkie at our side, a fire in the stove and a good movie on the TV. Last weekend we caught two films by one of our favorite actors, Tom Selleck. On Saturday night the feature was Jesse Stone: Benefit of the Doubt, and the next night a Western, Last Stand at Saber River. We’re both fans of Westerns, and in fact it was another Selleck film, Crossfire Trail, that inspired us to seek out what turned out to be one of the best vacations we’ve ever had. More about that later. 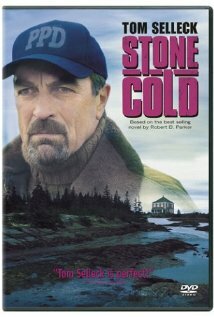 In the Stone picture, Selleck plays the title character, based on the mystery novels of Robert B. Parker about the police chief of a small Massachusetts coastal town, Paradise. Jesse Stone was a detective on the Los Angeles force when he was fired for being drunk on duty. Going through a tough divorce, Stone is offered the job as chief in sleepy little Paradise, where of course there is always more going on than meets the eye. Benefit of the Doubt was the eighth and final entry in the series, which Selleck also produced. The first film, Stone Cold, premiered on CBS-TV in 2005. After the last one aired in 2012, the word was that CBS was not interested in continuing the series, even though the films had always garnered very respectable ratings. Although it has long been the highest-rated network on TV, CBS periodically has fits when it thinks it has to appeal to younger viewers. The first time was around 1970 when the network began trashing such popular sitcoms as The Beverly Hillbillies and Green Acres in favor of shows that would appeal to a younger, supposedly hipper audience. Now it seems that they believe Selleck, and his viewers, are too old. He gets strong ratings, but to some, Tom is past his prime. Selleck says he would like to see the franchise picked up again, perhaps by another network–the Hallmark Channel regularly runs the films–but only if he could have sufficient budget to ensure a quality production. In the meantime, he is at work on his new series, Blue Bloods, which is also shown on CBS. Selleck portrays NYPD Commissioner Frank Reagan, but he is often not the central character of the show; younger actors carry the action and drama, which is perhaps why CBS keeps it on the air. Reagan is a widowed former Marine Corps officer and Vietnam vet, and his three grown children are usually the focus of the show: sons Danny (Donnie Wahlberg) and Jamie (Will Estes), both of whom serve on their father’s police force, and daughter Erin, an assistant district attorney who often clashes with her detective brother Danny. Erin, played by Bridget Moynahan, goes by the book, while Danny sometimes doesn’t even bother to open the book. Before the series, Moynahan, 43, was better known as the mother of Patriots’ quarterback Tom Brady’s child. Although a Selleck fan from way back, I haven’t gotten into the show. Nor was I a major fan of his breakthrough series, Magnum, P.I., which aired from 1980-88 on, you guessed it, CBS. In that show Selleck played private investigator Thomas Magnum, a former Navy officer and Vietnam vet who lived in the Hawaii guest house of the mysterious recluse Robin Masters. The show was well-received and Selleck’s easy-going, sincere style of acting brought his show strong ratings and brought the actor fame and fortune. Selleck’s charm, his looks, his Ferrari and Hawaii made Magnum PI a major hit in the ’80s. A Stetson instead of a fedora. Selleck was born in Detroit and raised in California. He attended USC on a basketball scholarship and got into acting. He also served six years in the National Guard, and has often portrayed veterans on screen. Magnum was his first big break, but he missed out on another one shortly after the series began when he was offered the role of Indiana Jones in Raiders of the Lost Ark. Universal Studios wouldn’t allow Selleck to take time off from the series to make the film, so he took the high road and honored his contract. The role, of course, went to Harrison Ford and the film was a monster hit. 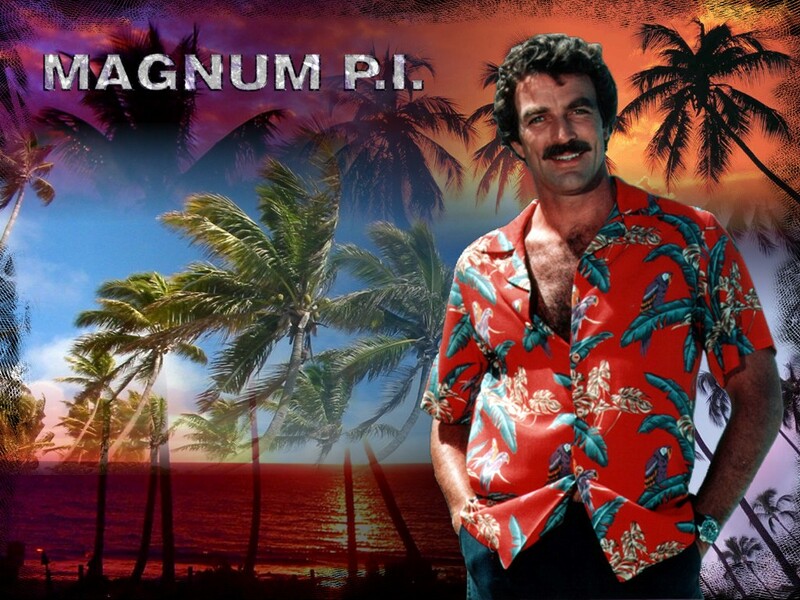 As it turned out, a writers strike delayed production of Magnum for several months, which would’ve allowed Selleck enough time to make the movie. Ford became a superstar with the role of the intrepid pre-WWII archaeologist, but Selleck has done all right. Earlier I mentioned a Selleck Western that inspired us to go out West ourselves. 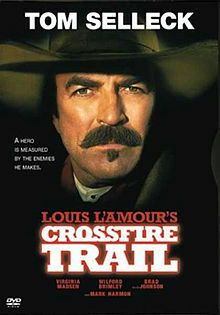 Crossfire Trail, based on a Louis L’Amour novel of the same name, aired on TNT in early 2001. (Spoiler alert!) The movie’s tagline, “A hero is measured by the enemies he makes,” pretty much sums it up. The story is set around 1880 and Selleck plays Rafe Covington, a drifter who promises his dying best friend that he will look after the man’s wife and their ranch in Wyoming. Rafe and two companions make their way to the ranch and find it deserted, so they start bringing it back to life. Going into a nearby town for supplies, Rafe learns that his friend’s widow, Anne (played by Virginia Madsen), is staying there and being wooed by the town’s de facto boss, Bruce Barkow (Mark Harmon, shortly before beginning his long stint on NCIS). Anne refuses to believe Rafe’s story about her husband, but Rafe suspects something else is going on, as she does not appear to be too enamored of Barkow, either. Sensing a rival, Barkow hires some local thugs and a renowned gunfighter to run Rafe and his friends off the ranch. There’s a goodly amount of gunplay and as you might expect, Rafe prevails and Anne comes around. The movie was filmed on location near Calgary, Alberta, and that started Sue and I talking about taking a vacation out there. The thought of spending time on a ranch had always been intriguing to us, so my intrepid travel-agency-owner wife did some research and found Homeplace Ranch, also near Calgary. 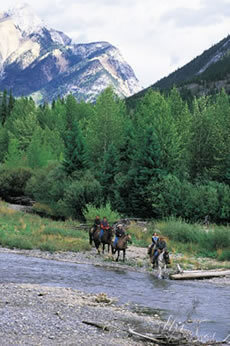 In August 2001 we spent a week there, riding horses and enjoying the magnificent scenery of the Canadian Rockies, with side trips to interesting places like Banff. Our hosts were Mac MaKenny and his family. At the time the ranch had a guest lodge big enough only for a dozen guests, and everybody took their meals at the main dining table. The place was a little on the rustic side but the hospitality was first-rate, as was the food, and the riding was, well, I don’t think terrific is a strong enough word. Selleck has made some other fine Westerns, like The Sacketts, in which he costars with the venerable Sam Elliott, and Quigley Down Under, which Selleck has described as one of his favorites. Released in 1990, it’s the story of Matthew Quigley, a sharpshooter who is lured to Australia in the 1870s by the promise of a job requiring a man of his skills. Upon arrival at the sheep station, he is informed by the owner, Elliott Marston (Alan Rickman), that Quigley’s job is to shoot the aborigines who have apparently been irritating the rancher. Quigley refuses, but Marston, who fancies himself an American-style gunslinger, doesn’t take kindly to the refusal and a fracas ensues. In the end, of course, the good guy prevails and Selleck again gets the girl, this time played by Laura San Giacomo. The rifle used by Quigley in the film is a fully-functional replica of the 1874 Sharps rifle, a .45-110 weapon with a range of about 1200 yards, aided by a Vernier sight. The three rifles used in the film were specially manufactured by the Shiloh Rifle Company of Big Timber, Montana, and Selleck kept all three. Sixteen years after the film he donated one of them to the National Rifle Association for a raffle, and the weapon fetched $69,000 at auction. Shiloh still offers the rifle for sale to the public. Log onto the company’s website, www.shilohrifle.com, and the visitor is greeted by the theme music from the movie. And if you’re ever in Forsyth, Montana, on Father’s Day weekend, you can participate in the Matthew Quigley Buffalo Rifle Match, the largest shooting competition of its kind in the U.S.
Selleck, as Quigley, prepares to demonstrate his marksmanship for the skeptical Aussies. One of Selleck’s trademarks is his truly awesome mustache. As Jesse Stone, his ‘stache is somewhat reserved, but in other shows, particularly his Westerns, he allows it to have more flair. 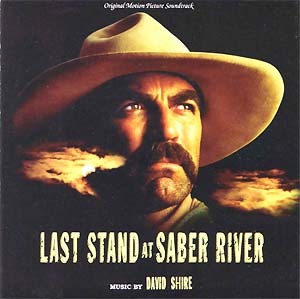 In Last Stand at Saber River, in which he plays a Confederate veteran returning to Texas to retrieve his wife and children and go back to their ranch in Arizona, he appears fully bearded at first but then trims back to a long mustache. When Selleck guest-starred on some episodes of the sitcom Friends in the late 1990s he played an opthalmologist who was the boyfriend of Courtney Cox’s character, and Selleck played the role sans the ‘stache. Although Selleck was, of course, very good in the role, it just wasn’t the same seeing him clean-shaven. No wonder Monica wound up marrying someone else. This role was one of the best for Selleck and for his mustache. I was surprised to read that Selleck turned 70 just last month. He sure doesn’t look it, but then again, how many Hollywood septuagenarians look their age? Hopefully he’ll get back in the saddle again sometime soon; hey, John Wayne made Westerns well into his seventies, and they were good ones, too. Some have said Selleck is this generation’s John Wayne. He does share some of the Duke’s best qualities: he’s tall, good-looking, has an amiable style of acting and can handle a horse, a six-shooter and a rifle. To me, Selleck will always be the actor whose film inspired us to enjoy one of the best vacations ever. Ride on, Tom. Previous Post: Going to the mat. Next Post: His name is Bond. James Bond. Hello, Cheryle. Thanks for visiting. If you’re interested in blogging, I’d first recommend finding a platform that is easy to use and allows you to present your blog in a way that enhances the theme of your blog. For me, that’s WordPress, although there are several alternatives. The number one rule, though, is this: content is king. You can have all the bells and whistles a platform can provide, but if you don’t have interesting, well-written content, you won’t get many readers who will keep coming back for more, and tell their friends. Good luck. Hello, I log on to your blog daily. Your story-telling style is witty, keep it up!